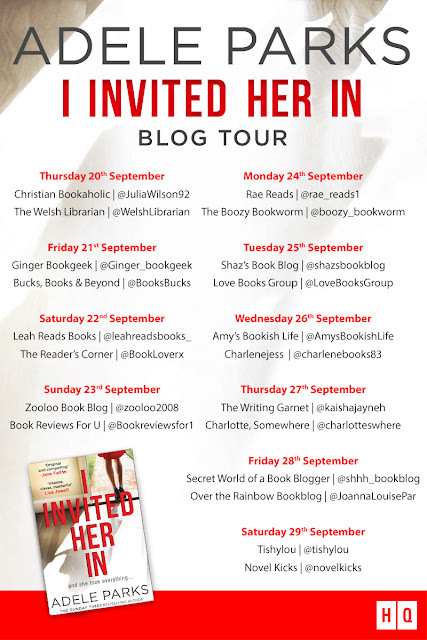 Thank you to the publisher for sending me a copy of this book in exchange for an honest review and for also allowing me to take part in this blog tour. I invited her in… and she took everything. When Mel hears from a long-lost friend in need of help, she doesn’t hesitate to invite her to stay. Mel and Abi were best friends back in the day, sharing the highs and lows of student life, until Mel’s unplanned pregnancy made her drop out of university. Mel and Abi were best friends at University, until Mel's unplanned teenage pregnancy made her drop out to raise her son, Liam. Seventeen years on and their lives couldn't be more different. Mel is now in a happy marriage, with 3 wonderful children and enjoying a chaotic but happy family life. Abi, on the other hand, followed her lover to LA where she became a well known TV presenter and took on a life of parties and indulgence. Life for Abi was perfect until she caught her husband cheating. Out of the blue Mel receives an email from Abi and she invites her to stay. But did Abi get in touch because she really needed her old friend or has she got something sinister in mind? Adele Parks is an author who is new to me but when I heard about I Invited Her In it sounded so intriguing that I knew I had to discover what it was all about. This is a twisted story all about friendship, betrayal and jealously and one that will keep you up all night thinking about. Can secrets really be kept secret? and what will happen when they get found out? The answers to these questions and more are discovered throughout the novel. What I like about the narrative in I Invited Her In was that you got to discover both sides to the story from Mel and Abi. This in turn gave you a deeper insight into why they were acting the way they did. Sometimes in novels you don't get to see both sides of the story so this was a refreshing change and made me understand both Mel and Abi in a deeply rooted way. It was also great to see perspectives of other characters such as Mel's husband, Ben and her son, Liam. I don't usually like books with multiple perspectives but for this type of story it really did work. Despite this, I did find the story to be a very slow burner, and in my opinion it could have been a lot shorter than it was. Some points were drawn out and this at times did nearly force me to skip over them. I also found the huge plot twists to be rather predictable - it was pretty obvious to me what was going to happen and this was mildly disappointing. Mind you, one thing that did surprise me was the ending and I really enjoyed being proven wrong as least once when reading I Invited Her In. Mel is a character, that at times I just wanted to scream at! I found her to be far too considerate and nice towards Abi and I was just wanting her to find some confidence to stand up to her. I understood that they way she acted was out of guilt for what happened between the two at University but it was very frustrating. Abi, I didn't like at first but once I got further into the story I started to feel sorry for her. This in turn made me understand why she acted how she did. Like I said there's always two sides to every story. 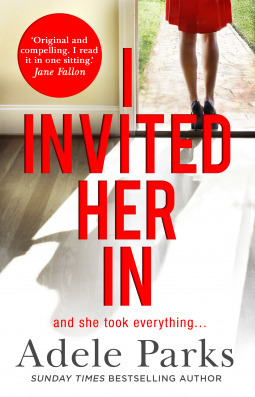 I Invited Her In overall, was an intriguing, twisted story all about friendship, revenge, secrets, lies, guilt and jealously. It will certainly lead to many discussions and I am glad to have read it and to have delved into the work of Adele Parks. I didn't find Mel nice towards Abi. When she first came to her house, Abi is in tears and telling about her cheating husband. The only thing Mel cares is her children are in the room.. She wishes her to stop. A true friend will never do that. Either will tell children to play elsewhere, or they can move elsewhere. I think she is portrayed as nice but she isn't really!